Yes, we do! Quinoa is growing in popularity as a healthy gluten-free alternative to traditional grains such as oats and couscous and the interest from farmers to grow it is also increasing. Australian Grown Quinoa is being produced in Western Australia where they have been experimenting with traditional quinoa crops however the only commercially grown organic quinoa is grown on a farm in Tasmania by Kindred Organics (http://www.kindredorganics.com.au/quinoa). The climate in Tasmania is ideal for growing quinoa as it is similar to countries in South America such as Peru and Bolivia, who are among the largest producers of quinoa in the world. QUINOA FACT: Quinoa (Chenopodium quinoa) was cultivated and eaten by pre-Incan cultures 6000 years ago and is rich in essential amino acids, vitamins B2, E and A and has the highest iron content of any seed! IMPORTANT TIP: Always wash your quinoa before cooking as the outer hull of the seeds are covered in a substance called Saponin which protect quinoa from insects and birds but has a strong bitter taste that can remain after cooking. Unfortunately while we would love to use the Kindred Organics product for our Thistle Be Good range, it is not pre-washed and therefore unsuitable for our process. We really hope that one day we will be able to source a pre-washed version and we can look forward to using Australian grown quinoa in our delicious gluten free quinoa blends. 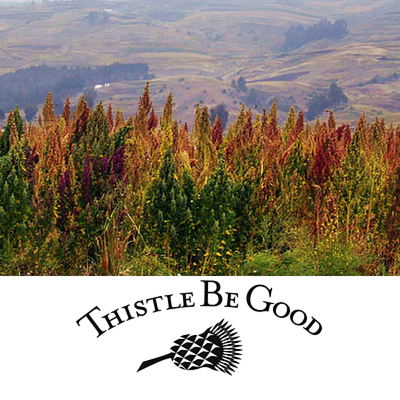 If you have heard of Quinoa but never tried it before or are searching for a new gluten-free food to try then Thistle Be Good recommends you try Quinoa as a superfood alternative. Why not head to our online shop and order a pack of our different varieties and start experimenting. It is a yummy alternative that even the kids will love!